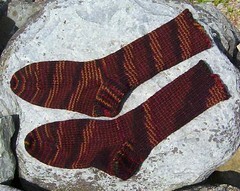 Not All Those Who Wander Are Lost: Another warm pair . . . .
. . . . of socks for me. :-) I've really enjoyed knitting with the Patons Decor yarn 75% Acrylic 25% Wool and I'm thinking it's the wool that has made the yarn most fexible in my hands. Perhaps some of the wool experts reading this could tell me. It's the wool that makes the difference isn't it?